Supernews is a citizen-generated, citizen-funded news and idea network that encourages young South Africans to change the content of the news as we know it, one success story at a time, one big idea at a time to increase awareness, change systems and influence new ways of thinking; democratise the news-making environment by generating news content via crowd participation – namely, a Citizen Journalist Network; and to create new news and build an open innovation platform that will attract, showcase and invest in the new news-maker, inspiring them to solve social challenges affecting the country. 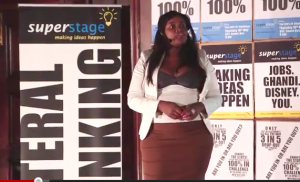 Through the Super Stage platform, Supernews encourages young South Africans to brainstorm, develop and share solutions to social, political and environmental problems. The best ideas are voted for by the Supernews audience (made up of fellow students), and, as part of their prize, the team behind the winning ideas are given the financial and strategic support necessary to pilot and implement their ideas. Students heeded Supernews’ call, and entries poured in from around the country. 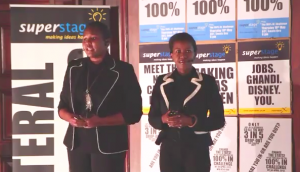 Eleven finalists were selected, and presented their ideas at the Super Stage showcase held on the 10thof May. As part of a series to share the top ideas, this blog showcases two of them (The Bigger Picture and Info=Choice=Success) below. system into qualifications, The Bigger Picture will ensure that students have the experience necessary to help them make informed decisions about their studies, and ensure that students and employers are creating successful pathways for young people from education, into employment. Click on the right for their presentation outlining their concept. To learn more about how you can join the Super Change Makers and to the efforts to lower drop-out rates, visit the Super Stage platform and join the movement to change the news, one idea at a time.